Regardless of which holiday you celebrate, there is usually the need to have a party, or go to a party. And that means either serving adult beverages to your guests, or bringing a hostess gift to a party. If you’re hosting the party, you want to be sure that every detail is perfect, especially the wine you serve. And if you’re bringing a host gift, you want to ensure it won’t be re-gifted, along with the President Obama Chia Pet that someone else brought. A delicious French red is the perfect holiday wine idea! Here, we round up six Bordeaux red wines under $15, four of which are tremendous Quality to Price Ratio bargain wines! And make sure you check out the entire post, as I’m going to announce a giveaway this week, and you won’t want to miss it. As part of a media campaign, Planet Bordeaux engaged several wine writers to taste a selection of six red wines from Bordeaux. 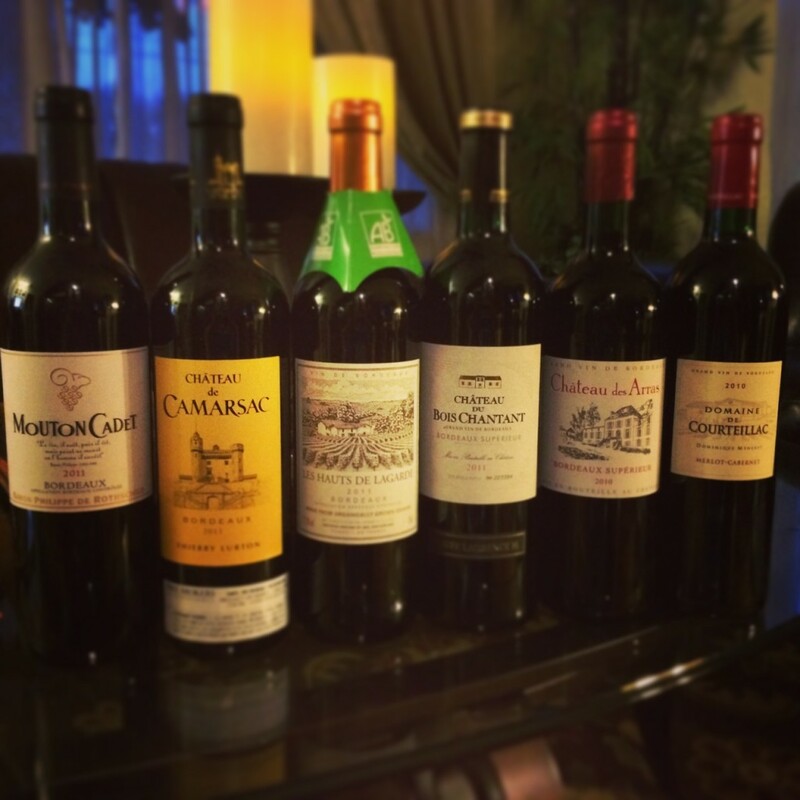 Dubbed “Planet Bordeaux for the Holidays”, we were asked to taste and tweet about the wines. The wines were all merlot dominant blends, and selected for their food friendly nature, as well as their very budget friendly price. The most budget friendly wine of the tasting was the Mouton Cadet 2011. A scant $10, the Mouton Cadet Bordeaux 2011 is a blend of 65% merlot, 20% cabernet sauvignon and 15% cabernet franc. A dark inky purple and garnet in the glass, the bouquet is black and blue fruit, cranberry sauce and spice. 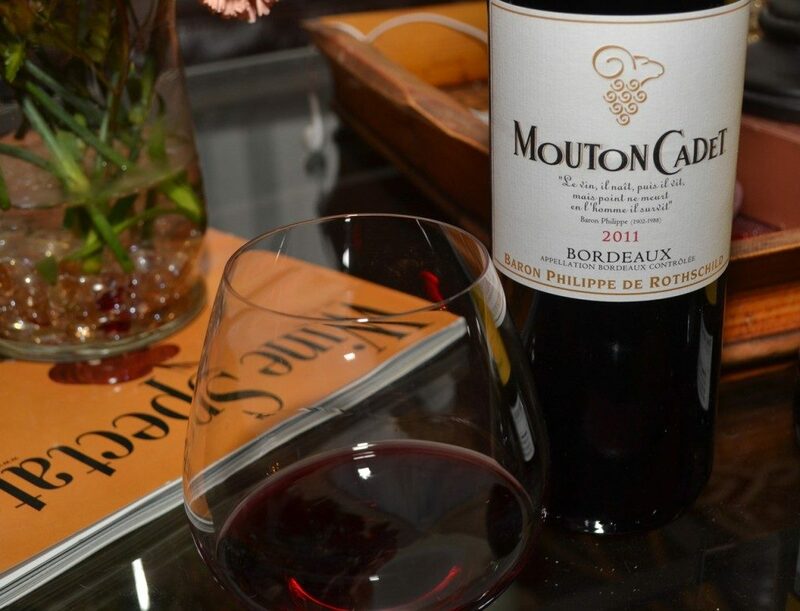 Not elegant or sophisticated, the Mouton Cadet Bordeaux 2011 palate is medium to full body, and is dusty dry with flavors of black tea and black pepper dominating. There are very subtle hints of black cherry on the palate, but the fruit is barely a supporting character in this play. During the tasting, my friend Melanie of Dallas Wine Chick agreed this is really more a food wine than sipping wine, as this Bordeaux red wine was very cheese friendly, and worked fine with Cabot Cheddar cheese. 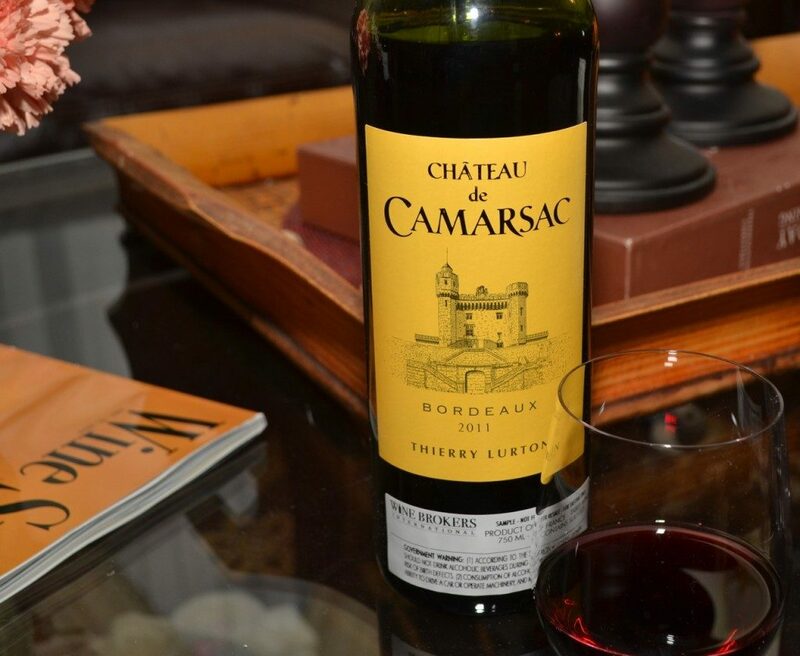 Maroon and ruby colors in the glass, the Chateau de Camarsac 2011 is a $12 blend of merlot, cabernet sauvignon and cabernet franc. There were some funky barnyard scents on the nose, something I personally am not a fan of, even if they’re not terribly strong. Nothing like the bouquet, the palate was is earthy leather, with dried blueberries from the merlot integrated with earthy mushrooms. There was mild but noticeable acidity and firm tannin, which will almost disappear when paired with beef, lamb, or even cheese. The third wine of the tasting really knocked my socks off. At $12, this wine is made with organically grown grapes, and can be found in most whole foods. 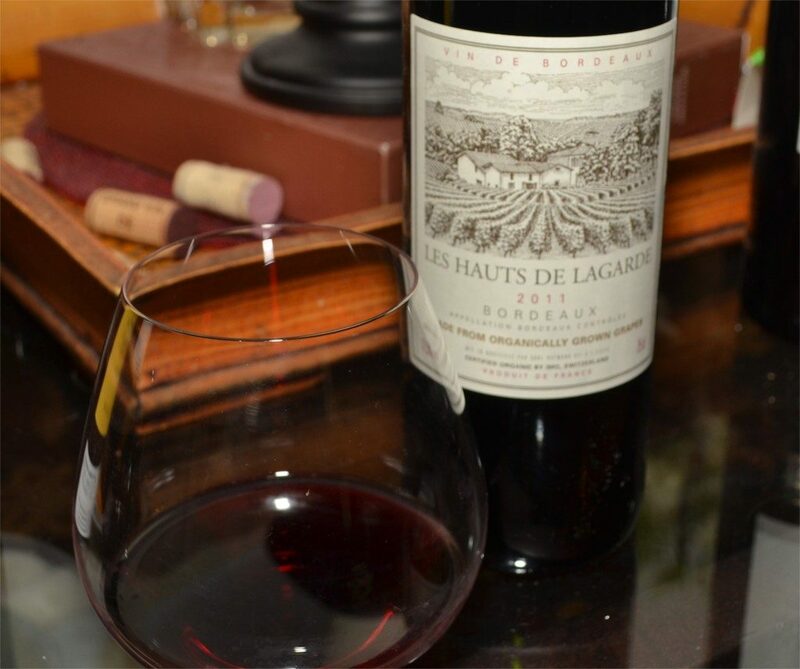 The Les Hauts De Lagarde 2011 Bordeaux is 65% merlot, 25% cabernet sauvignon and 10% cabernet franc, with it’s organically grown grapes hailing from vineyards in Saint Laurent du Bois, Bordeaux. The bouquet reminded me of an old, leather bound book, with organic scents mixed with cranberry and currants. The palate was medium bodied, leaning towards full, and was not dusty at all. Fine, well integrated tannin, a little blueberry mixed with black currant, there’s great oak integration on this wine. The wine is almost soft and feminine, with a lingering finish that has hints of spice. This wine will work with almost any holiday fare, and I even recommend this delicious Bordeaux red wine for Thanksgiving. Drink now through 2014. Speaking of Organic, later this week, Wednesday or Thursday, I’ll be posting about Harry & David‘s organically grown pears. I’ll feature them, as well as a recipe and wine pairing for you enjoy this holiday season. However, the best part is that you’ll be able to enter a giveaway to win a box of the pears! So, make sure you check back later this week to have your chance at a delicious holiday gift from Harry & David. To be sure and not miss the post, subscribe to my blog via email via the form on the top left of this article! The Helfrich family is the proprietor of the next wine, the Chateau du Bois Chantant Bordeaux Superieur 2011. 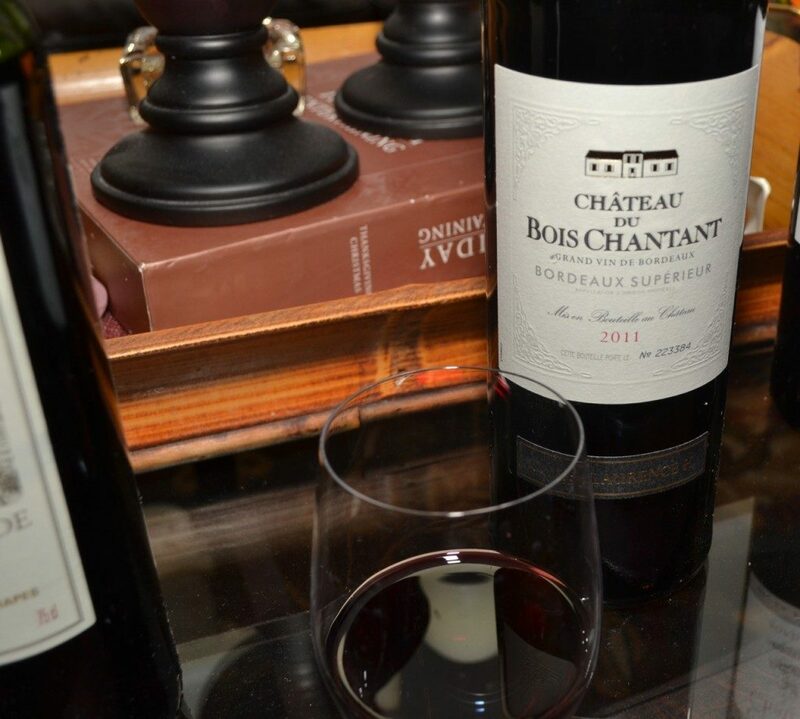 A blend of 90% merlot and 10% cabernet sauvignon, the Chateau du Bois Chantant is a full bodied, well balanced Bordeaux wine, and quite a bargain at $13. Similar to the Les Hauts de Lagarde, this budget friendly Bordeaux red wine was quite elegant. The nose is much more floral than the previous three wines, with violets swirling around the glass, along with notes of cherry cola and soft cinnamon. A deep, dark purple in the glass, the full mouth feel showed elegant plum and cherry with soft, well integrated tannin all around. There was a little black tea on the finish, which leads into a nice, toasty spice which was warming like a holiday fire. While it will work with almost any holiday dish you serve, I felt the Chateau du Bois Chantant would work well with poultry, perfect for your Christmas goose. Drink now through 2014. As an aside, I had the pleasure of meeting Anne Laure Helfrich earlier this year, and have some of their fantastic Alsatian pinot blanc and riesling to talk about in upcoming articles. The next wine from Bordeaux in this tasting was the Chateau des Arras Bordeaux Superieur 2010. A blend of 70% merlot, 15% cabernet sauvignon, and 15% cabernet franc, this $14 budget wine from France really was excellent for the price. The color was more garnet than purple, with a meaty, gamey nose that showed some fruit. It wasnt a terribly expressive bouquet, but deep sniffs bring blueberries and spice. The palate, however was elegant and refined, with fine integrated tannins. This is the wine to pair with your holiday roast, so bring on the prime rib, as the Chateau des Arras can handle it nicely. Flavors of blueberry and cranberry layered with a dusty earth component, and flavors of cherry intermingled in. This wine absolutely sung with cheddar cheese, as the tannins eased, the dried cherry and blueberry fruit came froward and there was a long, delightful finish. 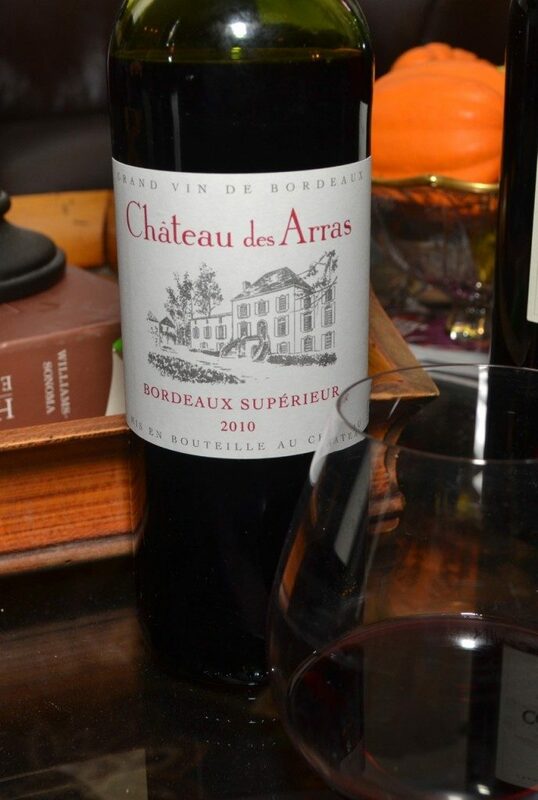 My final tasting note on the Chateau des Arras Bordeaux Superieur 2010 was “loved the last sip, the fruit was swirling around my mouth, the spices were soft and so back stage, there was an earthiness to this that sung, there was nice structure $14 worth of yum.” Drink now through 2016. As you end your year on a good note, we end this post (and tasting) on a good note. 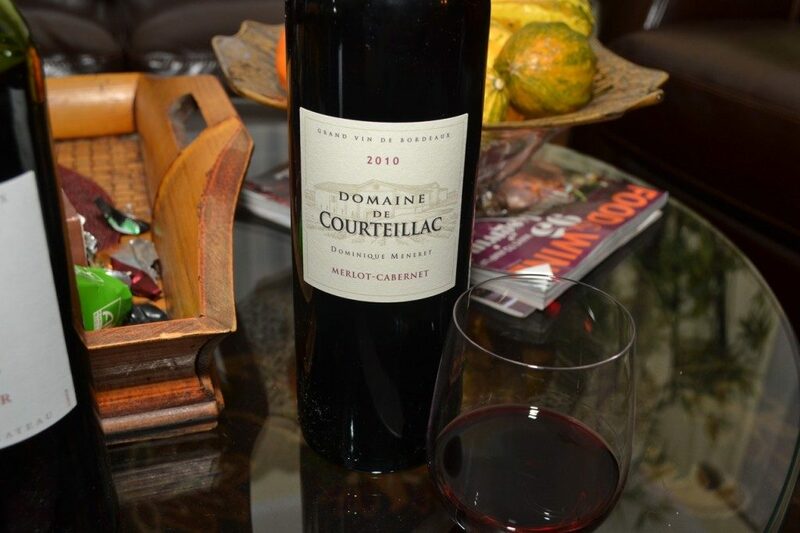 The last Bordeaux red wine of the tasting was the Domaine de Courteillac Bordeaux Superieur 2010. The bouquet is teeming with earthy spice, and doesn’t show much fruit. Inky black in the glass, the palate is very elegant and complex. Layers of flavor start with coffee and mocha, with dark cherry and cola flavors as well. Merlot dominant, but blended with cabernet sauvignon, this $15 wine is harmonious and balanced, bringing power, length and flavor. Another very food friendly wine, it loved the cheese course, but will pair perfectly with beef, lamb, and venison as well. My last tasting note of the evening was “This wine is REALLY so good with the cheese !!! wow!! !” Drink now through 2016. I hope you were nice this year, and Santa, or Harry Hanukkah, brings you presents as good as these wines. I highly recommend the last four, as they offer the most quality for the price. The Les Hauts de Lagarde Bordeaux 2011 at $12 is a steal, as is the Chateau du Bois Chantant Cuvee Laurence Bordeaux Superieur 2011 at the same price. The Chateau des Arras Bordeaux Superieur 2010 is still a budget friendly wine at $14, and a great example of what Bordeaux wines can be at reasonable prices. Finally, at $15, the Domaine de Courteillac Bordeaux Superieur 2010 may be the perfect wine for your holiday party this year! I’d love to hear from you! Have you had any value driven wines from Bordeaux lately? Let me know below!